Karina Macias is working to make a difference in Huntington Park. Voted in as mayor in 2014, she has the distinction of being the youngest mayor in the long history of the city. With civic engagement as a top priority, Mayor Macias established the Huntington Park Youth Commission to develop the knowledge, skills, values and motivation of their young citizens to make community service meaningful throughout their lives. In 2015, Huntington Park became the first city in California to appoint two undocumented immigrants to commissioner positions. Her global perspective focuses on attracting future investment opportunities for Huntington Park to make it more competitive not just locally but internationally. Prior to becoming a city council member, Macias deepened her community outreach skills through her work with the Sisters of St. Joseph in their Social Justice Office, managed an emergency monetary assistance fund, and co-chaired the Southern California Partners for Global Justice. 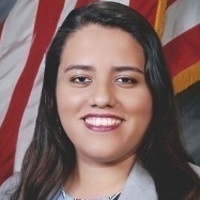 In addition to being a City Council member, Karina Macias serves as Huntington Park’s representative on the Eco Rapid Transit Board, 710 Project Committee and Sanitation District Board. This event is free but seating is limited. Guests must register to attend. Please email annemjoh@usc.edu to request an invitation. Please email annemjoh@usc.edu to request an invitation.